Hazel Simmonds-McDonald, the author of 'Shabine,' attended Stanford University. 'Shabine' is the story of Justene, a mixed race woman who is constantly mocked for being poor, of mixed heritage, and presumably promiscuous. She was taunted with the words jamette and shabine (half white, or of mixed heritage) on the streets. The story opens with the narrator explaining that she had a fiery temper, which she unleashed on her tormentors when provoked. Her two sons, Gold and Silver, were subjected to similar taunts, with Silver reacting in the same way as his mother, while Gold tried to do damage control. The reader then learns that Justene had lived with her mother, who was a maid in Justene's father's house. It is implied, by the narrator, that her mother invited white sailors surreptitiously into her house to sleep with Justene. The rest of the story is filled with the narrator's regret for what could have existed between him and Justene. The name of the Caribbean island is not mentioned. The story is set around the time of WWII, when American troops were prevalent in the Caribbean. She is described as having 'pale, reddish skin colour, the mass of coarsish red hair that resembled the wool of sheep, the grey eyes ... the chocolate freckles.' (Simmonds-McDonald, p.14). She is very coy and provocative, as can be seen in her response to the narrator. She does not fear her taunters, but boldly defends herself. She is fiercely protective of her children, as can be seen when she defends them. She is a proud woman who does not want her children to stoop to the level of their taunters. He seems to be completey enthralled by Justene, as is seen with the token gift of paradise plums, that he ritualistically left for her on the gate post. He mourns the loss of the possibility of a future that he might have had with Justene. Gold - Justene's son. He had thick wooly red curls, red bushy eyebrows, a freckled face and grey eyes. Silver - Justene's son. He was sort of blond, he had straight close cropped, sun bleached white hair and he was fearless. Mr. Cazaubon - Justene's mother's employer. He is also Justene's father, but he does not acknowledge her. Mrs. Cazaubon - Wife to Mr. Cazaubon. She is aware of Justene's parentage, and treats mother and child in a contemptuous manner. Shabine's mother - Mrs. Cazaubon's maid. It is rumoured that she died from 'too much rum and grief because Misie Cazaubon had never kept his promise to her to acknowledge Justene as his daughter and to send her to Convent School.' (Simmonds-McDonald, p.13). This theme is brought out by Justene and her two children. She protects them by dispersing her children's tormentors in a hale of her own words and stones. She then told them that they should not respond to their tormentors because they would become like them. This is the hallmark of a loving mother. She defends and protects her children, yet teaches them the value of maintaining their pride. This is in contrast with the very vague details surrounding the relationship with her mother. Whereas the reader sees Justene hugging and comforting her children, there is only the implication that Justene's mother allowed white sailors to 'visit' her home, implying that Justene might have been the lure, or the mother herself. The narrator also implies that he had good intentions towards Justene through his shy, patient and consistent courting. However, Justene's mother discourages this: 'Justene's mother had come to complain about his giving of paradise plums and putting ideas in Justene's head and upsetting her life' (Simmonds-McDonald, p.14 ). The narrator implies that the mother robbed her daughter of a future that was close to 'paradise' as Justene would have gotten. She is not a totally bad mother, however, because she stands up for her child when Mrs. Cazaubon attempted to treat her like a servant. This short story highlights the fact that women, in general, have very few choices. Justene's mother has a child by her employer and remains under his roof. Many people would argue that she had a choice to leave with her child, but that is easier said than done. Raising a child takes a village, so it is difficult for anyone to decide to leave a space of financial security. The argument is the same for Mrs. Cazaubon. She stays with a man who has fathered a child, in her own home, with their maid. What is even worse is that the maid and the child, the evidence of her husband's indiscretion, remains in her home. Her impotence, concerning the situation and her life, is seen in her treatment of Justene and her mother, as well as her quarrels, or rather, abusive monologues, with Mr. Cazaubon. Both women are tied to this man based on the fact that he provides financial security in a world that can be even more cruel to women who lack this. The severe hypocrasy in the society, as it concerns the sexual indiscretions between men and women, is also highlighted in this short story. Justene and Mr. Cazaubon are treated very differently for their sexual indiscretions. Mr. Cazaubon remains a respected gentleman, despite fathering a child with the maid, and having them reside under the same roof with his wife, while Justene is stoned and castigated in the streets for keeping company with white sailors, as implied by the narrator. Society appears to have different rules for women and men in the sexual arena. 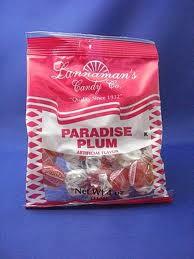 Paradise plums represent the alternate life that Justene could have had. The fact that this candy/ 'sweety' was used to court Justene in such a shy, innocent and consistent manner, implies that her life with the narrator could have been very pleasant and healthy. Simmonds-McDonald, H. 'Shabine' in A World of Prose, edited by David Williams and Hazel Simmons-McDonald. (Harlow, Essex) Pearson Education, 2005.